Special feature : Nakagojiri becomes Kurijiri style and Kesyo Yasuri done to the stem. He is the most famous swordsmith at Shinshinto ages for making Soshu-den and Bizen-den style Hamon. His blade forged with Soshu-den style are having texture such like whirlpool on Jitetsu. 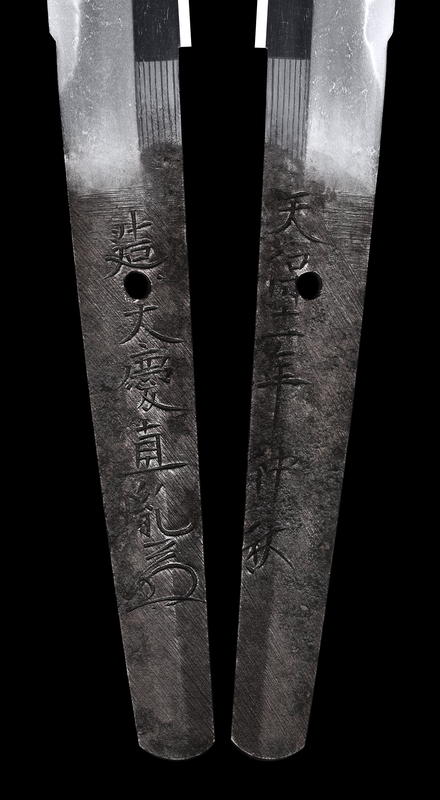 1 : Shape : The blade is wide and thick with rather deep curve and long Kissaki. 2 : Koitame-hada well grained with Jinie attach. 3 : Nakago-jiri is small Kurijiri shape. 4 : Hamon is deep Nioikuchi Suguha with small Notare Hamon mixed.